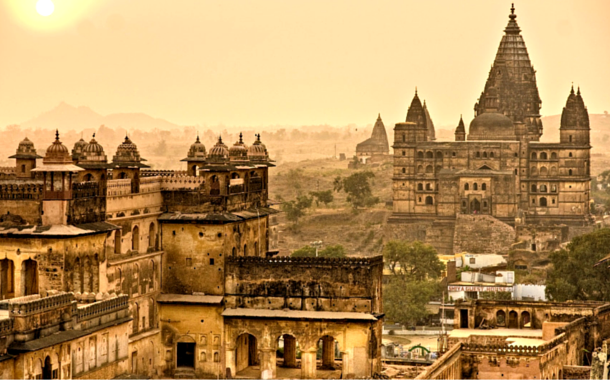 The small town of Orchha, lying on the banks of the river Betwa, literally meaning ‘the hidden one’, is one of the lesser known tourist spots. 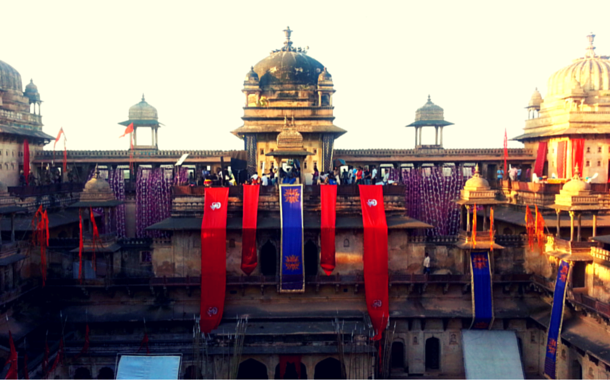 However, the grandeur of the forts and palaces mesmerises anyone who comes this way. Located in Tikamgarh district of Madhya Pradesh, all you need is an air ticket to go witness its beauty. 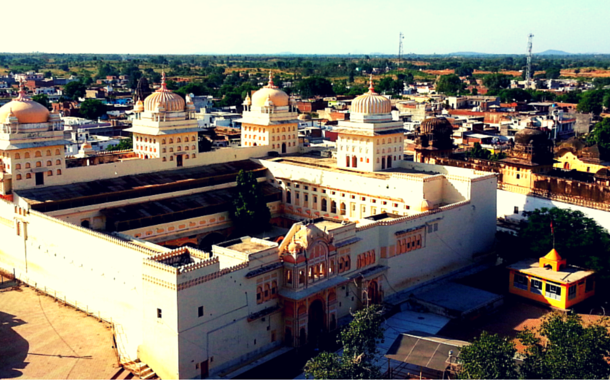 Established by the Bundela Rajputs, this well preserved medieval city makes for a perfect weekend getaway. 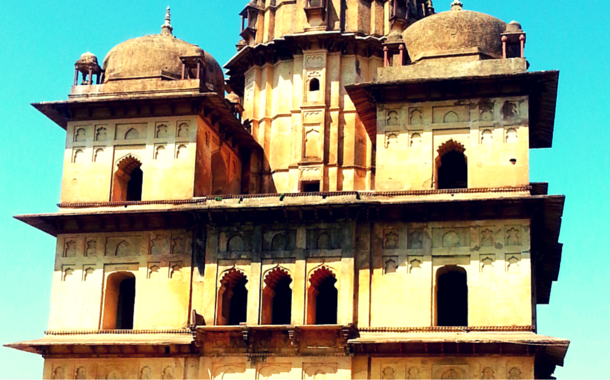 Built by Raja Bir Singh Ju Deo to commemorate Jahangir’s visit to Orchha, Jahangir Mahal is one of the most important monument in the Orchha fort complex. Built in the 17th century AD, this three storey tall palace decorated with turquoise tiles, has beautiful courtyards and hanging balconies replete with delicate chhatris and fine trelliswork. Overlooking the Betwa River, this palace also serves as a popular TV and photo shoot destination. Serving as the premise for the Sound and Light show, the inner chambers are decorated with vibrant murals of religious themes illustrating various episodes of the Hindu mythology. The palace, built by the religious Madhukar Shah, represents the Bundela School of painting in all its magnificence. The chhatris or the umbrella like cenotaphs, adorns the plain exterior. The engaging 50 minutes long Sound and Light show eloquently tells the tale of the Orchha Fort Complex. The two storey palace built for Rai Praveen, the beautiful court poetess and musician, tells the tale of her love and devotion to King Indramani. It is said that Akhbar, so smitten with her beauty, summoned her to the Mughal court. But so impressed was he by her love for Indramani, that he let her go. The palace is an architectural delight, surrounded by trees and the beautiful gardens of Anand Mahal. Legend has it that when Rani Ganesh Kunwari, wife of Madhukar Shah, brought the statue of Rama from Ayodhya, she temporarily kept it in the bed chamber of the palace while a temple was being built for its installation. However, when the statue proved impossible to be moved, she remembered the condition previously mentioned to her that once the statue was installed, it could never be moved again. Hence, this gave the statue its home in the palatial surroundings, where it is now honoured and worshipped.This is the only temple in India where Rama is worshipped as a King. Built to house the statue of Rama which refused to budge from its original position, this temple remained without an idol for a very long time. The interior of the temples are decorated with painting of the Bundela School of Painting, and the steep steps help you get some exercise while you’re on a vacation. The way upstairs is usually locked, but the Temple guard Manoj happily shows you around. It might be difficult to keep up with his swift gait, but he’ll ensure that you see every nook and corner of the temple. This temple is one of a kind where the architectural style blends fort structure with temple mounds. 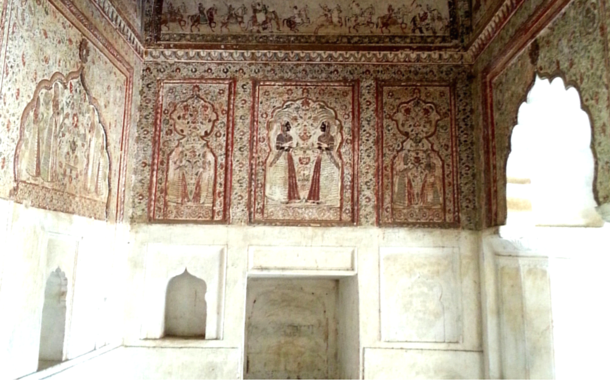 The ceilings and the walls are coved with well preserved and stunning murals, and frescos; and combine Mughal as well as Bundel art forms. The colours are still vibrant and depict various episodes in history including the war of 1857. What makes this temple stand out is that fact that there is no idol in the temple. Located on the Kanchana Ghat of River Betwa, these fourteen Chhatris dedicated to the rulers of Orchha just cannot be missed. With the exception of the cenotaph of Raja Bir Singh, which has Islamic features, the remaining cenotaphs have spires resembling that of a temple. While the vultures might be going extinct elsewhere, they seem to have found a home here, and one can see huge vultures soaking up the mid-day sun. However, some people do find this place a little ghostly despite the exquisiteness of the structures. 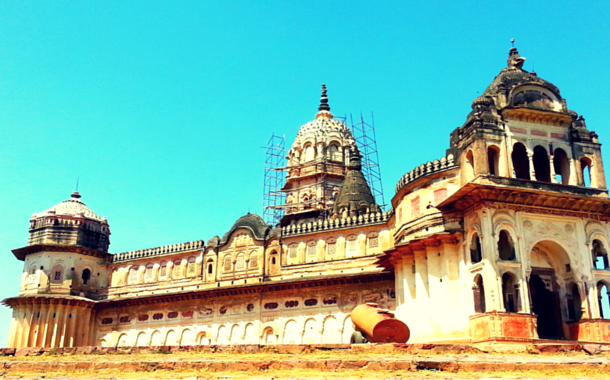 Orchha is a place where every little stone has a history. Having said that, the place has also progressed with time and you can find free wi-fi even at small cafes which serve delicious pizzas and pastas. So book your tickets and give your instagram followers something new to follow.